It was the mid-1980’s and I was working at a summer job. I was fortunate to have a neighbor who employed me, God rest his soul, who in his retirement started a small business selling hot dogs from a converted laundry truck that grew into a restaurant on wheels. He would be up way before the sun, cooking bacon and making gallons of fresh coffee. I would meet him at his favorite spot near a major roadway and start my day serving egg sandwiches, buttered rolls and hot coffee to customers traveling to work. After the morning rush, we would switch to hot dogs, chili dogs, meatballs, soda, and of course, more coffee, as it seemed that was the universal drink of the workingman. The days consisted of mad rushes serving a line of people stretching down the block to wondering when the next customer would show up. You may wonder where we went to the bathroom, especially since we were also constant drinkers of the magical black elixir. I typically ran up the street to a friendly furniture store that allowed us to use its facilities. The boss never left the truck, which had a sink and running hot water, as per code, but no bathroom accommodations. He did not think about hoofing it up to the store where I usually went. Instead, he had a special coffee can with a lid he kept under the counter. He cautiously looked up and down the street making sure no one was headed our way, and proceeded to take that special can, remove the lid and slid it under his apron. This was a much-practiced action, as he quickly undid his fly and I heard the stream hitting the bottom of the empty can, all behind the veil of that apron. Without warning, a group of hungry people appeared by the window and I jumped to start serving them. The boss had been caught by surprise, but he stealthily removed and capped the can, washed his hands and began serving the customers without missing a beat. I swear I could not figure out how he did this so quickly. I did not notice him go through the motions of putting it back in his pants or zipping up for that matter. 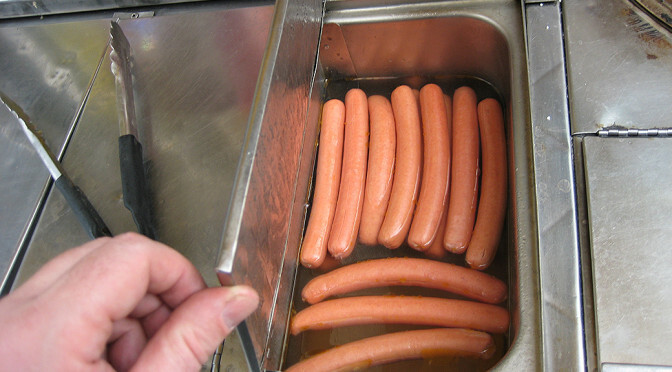 Yet there he was by my side, with a smile, sliding hot dogs into buns and asking if they wanted sauerkraut or onions.